Saddling up with buckets outside the party. 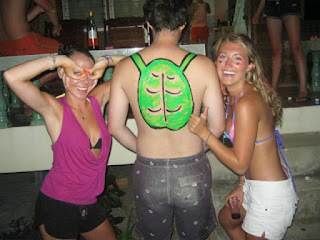 I believe the number one mandate of Full Moon Party is what happens at Full Moon stays at Full Moon. Therefore instead of sharing my complete personal experience with my readers, I’ll give you a general idea of what shenanigans go on. 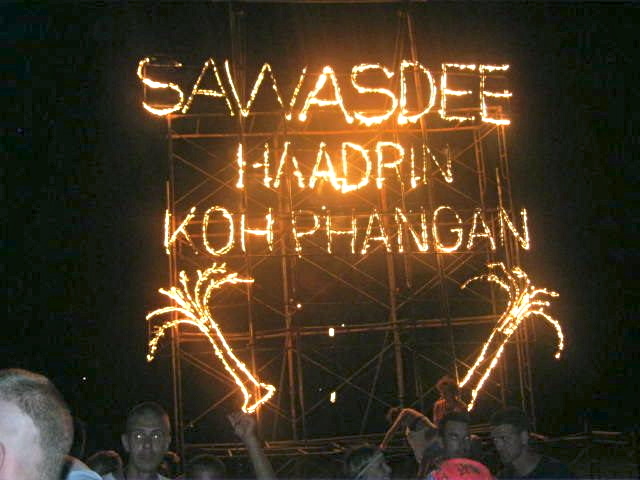 Full Moon Party is a once a month beach rave where backpackers and travelers from all over the world come to party their faces off on Haad Rin beach in Koh Phangan, Thailand under the moonlit sky. Full Moon has become one of those bucket list activities that everyone has to do at least once in their life. If you’ve never heard of it before, get yourself out from under that rock and join the rest of civilization! About 4-5 days before the party, the ferry from Samui to Phangan is chock full of 20-somethings with their body bag sized packs ready to head to the island to get set up for the upcoming festivity. Most bungalows, guesthouses, and hotels have started to maximize on the steady flow of travellers who come through each month so accommodation, food, transportation, and souvenir prices are inflated for about a week in the Haad Rin and surrounding area on the island. Places to stay also get fully booked fast so you have to actually pre-book accommodations, which you almost never have to do in Thailand. Normally, you can show up at a place and haggle a price of a room on the spot. Guesthouses also require a 4, 5, 6 or more night minimum and you have to arrive at least two days before the party. They really know how to get you and they know people will pay to stay because there is no other party in the world like this. During the low season (May – October) about 10,000 carousers cram on Haad Rin beach for the revelry. Up to 30,000 people attend Full Moon during the high season, which is nuts to me. That’s like LSU undergrad all piled together on a strip of beach. 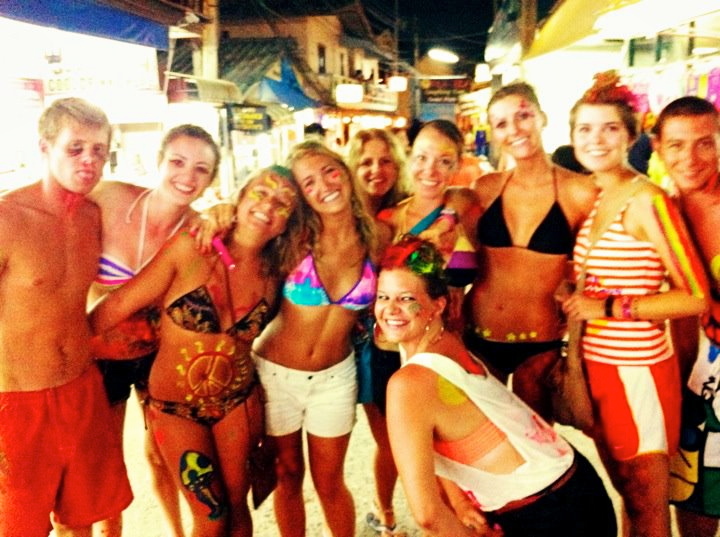 Heading to the beach for the Full Moon Party. I was really jacked up for Full Moon so I was appointed to take the reins as party planner and people followed my lead. I booked a bungalow in Baan Khai, which was about 10 minutes from Haad Rin, just for sanity purposes. If we were staying for 5 or 6 days I want to be able to choose when I can leave the party if necessary. I booked some super basic bungalows at the Blue Lotus Resort. Resort is an extremely generous term for this place. Bungalows are the common lodging choice in Thailand but this was like camping in the middle of nowhere. The owners cooked the best food I have had in Thailand and the man who ran the place took us wherever we wanted to go for free most of the time so it ended up being a good decision. Like I said earlier, book ahead if you plan to go. The night of the Full Moon party we painted ourselves up real nice with neon body paint in every perky color you can imagine. This was a necessity of the party. 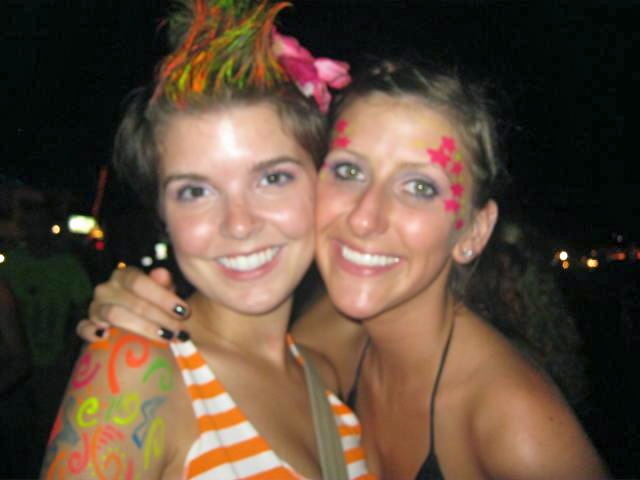 I became the designated body paint artist and even gave my friend Lindsey an outstanding mohawk. You should not bring anything to the party because you will either get it stolen or lose it, so I wore a swimsuit, shorts, and put some money in a plastic zip lock bag and stuck it in my back pocket. You even have to lock up your valuables in a safe at your bungalow because people raid guesthouses knowing everyone in town is at the party. The Blue Lotus owner drove the 14 of us in the back of pickup trucks down to Haad Rin beach where the party was already in full force. One of many body paint creations of the evening. Matt was given the Michaelangelo Ninja Turtle shell. The swarm of people and bright colored lights reminded me of the circus. 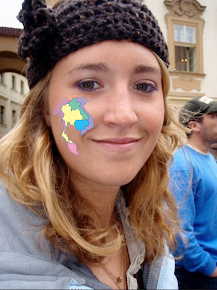 People from all over the world flooded the beach and I heard about 20 different languages in a 10-foot span. There is bar after bar of pounding music and people packed inside and outside dancing to the vibrations of the music. Lots of people stand on tables outside on the beach to dance and fist pump to the music. Fire breathers, fire jump ropers, water slides, and attractive people were in every direction I could see. Pretty much every person on the beach has a bucket in hand at all times. Everyone should know what a bucket is now, but if you don’t please refer to my explanation in Patong... Most people are either on happiness meds or wasted face but there are a few people who are high on life. It’s hard not to have an adrenaline rush with pounding music and 10,000 excited people twirling all around you. 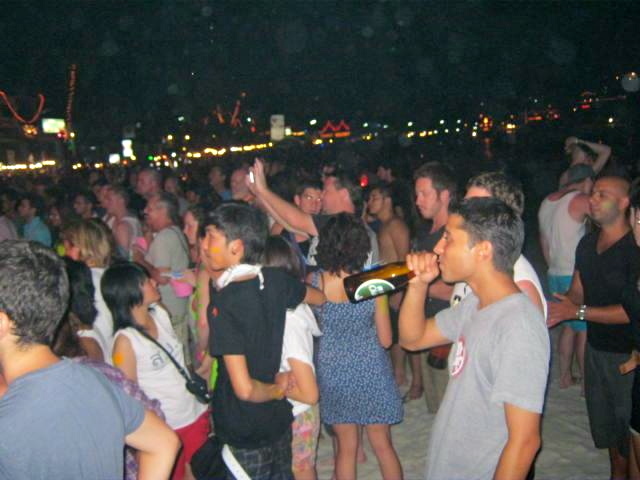 A small section of the crammed beach and bar lights in the background along Haad Rin. If you walk all the way down the beach and climb up a little hill (I think, it was dark) there is a place called Mushroom Mountain where you can look down at the view of the partygoers from up high. Many people trip on the way down from Mushy Mountain so you have to be careful. DON’T leave your skimpy thongs at home. Flip-flops (duh) you don’t care about losing should be worn on the beach because there is broken glass and who knows what else that could lead to a tetanus shot. DO book accommodation at least a week in advance or else you’ll be stuck in the boonies riding in the back of a tuk-tuk with 9 people on top of you to get to Haad Rin beach. 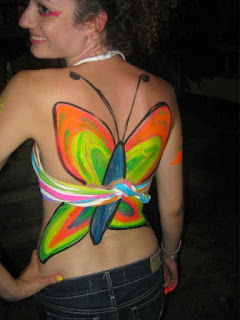 DON’T leave home without neon colored body paint; it looks awesome on the beach at night. DO lock up your valuables at the hotel safe and DON’T bring anything you care about losing – cameras, cell phones, shoes, purse, wallet, anything – it will get stolen or you will lose it. The recommended daily dosage of Krating Daeng (Thai Red Bull) is half of one bottle – DO switch mixers in your buckets or else you’ll be awake for 3 days. Random creepers throw pills up in the air and hope they land in girls’ drinks. Many times this works, but the nice creepers will just come up to you and offer you some random pills. 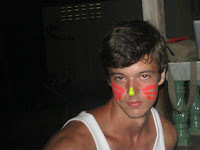 Ladies, DON’T take unknown drugs from unknown boys no matter how cute they are. If you decide to sketch off, DO let your friends know your whereabouts…even if it’s not until the next day. Remember there are Internet cafes everywhere. DON’T relieve yourself in the ocean. Go find a bathroom lazy face. Remember just because its nighttime doesn’t mean that it’s completely dark, this isn’t Mardi Gras. If you have tropical fever, DO fight through the pain because it is worth it. When you see fire jump ropers and fire breathers on the beach, DON’T participate unless you want some serious burn scars. Looks like it was an awesome party! It was awesome, thanks for reading! I hope you get to go someday, it's worth it!